Ariel - Our first stop was with this picture perfect Ariel. 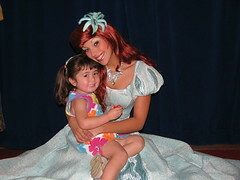 She was amazed that Dova was holding a little Ariel doll. Of course we forked over $31 for the official Disney portrait as well. 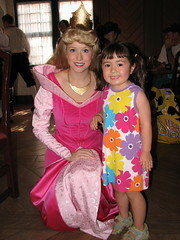 Sleeping Beauty - While eating, the first princess which stopped by was Sleeping Beauty. 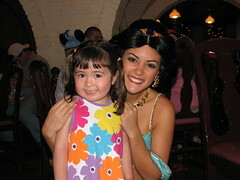 I, not being up on my princesses, had to ask who she was. I didn't know the color code yet (Sleeping Beauty = pink, Cinderella = blue, Belle = yellow, etc). 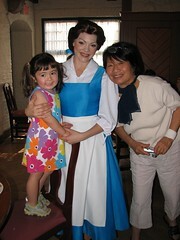 Belle - Here's grandma getting in on the princess action too. And Belle is only yellow when she is wearing her ball gown. Jasmine - This beautiful Jasmine gave Dova a nice hug and I think she was genuinely happy to receive one from Dova. Or else, they've really brainwashed these princesses well. 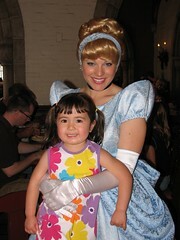 Cinderella - She also gave Dova a nice hug. The whole time the princesses were coming by, Adam refused to even look at them covering his head with his napkin (and rolling his eyes underneath I'm sure). This Cinderella was so sharp as she was leaving, she tapped him on the head and said "Bye, Prince Napkinhead". From them on, Adam was dubbed Prince Napkinhead and we still call him that to this day. and a Pillow Head: http://www.youtube.com/watch?v=smOt_0keUnU (who claims to be King of all Napkin Heads) Sounds like a battle might be brewing!!! !